Feast your eyes, people. Feast them like you’ve never feasted them before. Because this is surely one of the most glorious images of Jupiter, nay the universe, ever taken. Yep, that image belowis no cosmic painting. It is an actual image snapped by NASA’s Juno spacecraft while in orbit around the gas giant. It’s been processed by citizen scientists Gerald Eichstädt and Seán Doran to bring out the features a bit more, but those storms and swirls you can see are very much real and what a wondrous vista it gives us. 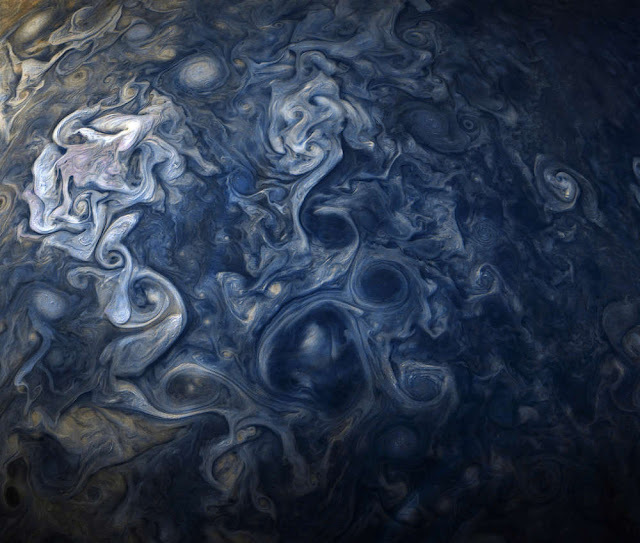 Nothing on Earth comes close to the complexity and beauty of Jupiter’s storms, intertwining with each other in the planet’s atmosphere to give us this swirling mess of beauty. The image was taken from a distance of just 18,906 kilometers (11,747 miles) above the surface of Jupiter’s clouds, approximately the distance from New York to Perth in Australia, NASA helpfully tells us. It shows us a cloud system in the northern hemisphere of Jupiter colored in blues and grays, as seen on October 24, 2017. It was taken during Juno’s ninth close flyby of the planet, and the scale in the image is 12.5 kilometers (7.75 miles) per pixel. The image was snapped by the JunoCam instrument onboard the Juno spacecraft. This has been responsible for plenty of fantastic images, which members of the public frequently process to bring out their glorious colors. We’ve recently been treated to incredible images of the whole planet, and even some of its moons. We’ve seen shadows from those moons cast on the planet, and we got a look at the incredible south pole of Jupiter thanks to Juno, which is unlike anything we’ve seen before. But for now, this latest image is deserving of all our focus. Will you see a better image of space today? I highly doubt it. Drink it up – Jupiter’s a beauty.